Designing a printed circuit board (PCB) that efficiently and effectively achieves target specifications is a challenge that requires close attention to a great number of details. The challenge escalates exponentially when you are designing a product that utilizes multiple boards that need to connect to each other through electronic interconnects. While you may feel like tearing out your hair as you try to accommodate all the variables in a multi-board assembly, there are some tried and true tips and considerations that can make the process smoother and less nerve-wracking. While true that a multi-board solution may not be the optimal approach in terms of functionality, there are reasons why you have to use this approach. It could be something as simple as accommodating for a strict form factor or the need to easily isolate power or sensitive signals. You may be charged with using an “off-the-shelf” board to talk to specific components or a custom board (such as LCD displays). Other reasons for stacking boards could include designing for future expansion (like the common Arduino shields), having multiple design configurations (maybe a basic version and an advanced version) or just making your design modular in general (a sort of mix-and-match). A separate board may be deployed to address a particular task in a trace-specific application, such as trace routing for capacitive touch, inductive charging, or custom resistances. Whatever the reason, keeping in mind some best practices and focusing on details will help you achieve your product goals with minimal difficulty. For example, when multiple boards need to talk to each other, the pin count will increase and component density, which can cause signal integrity issues, adds to testing time, creating a more complex product to manufacture. Life-cycle durability of the finished product can also be affected by an increase in boards connected to one another. There will be some bumps in the road, but if you stick to a good plan and employ sound principals to reduce common pitfalls and risks, the final printed circuit board, PCB interconnect(s) and application will reflect that same level of quality preparation. Putting a good PCB plan on "paper" starts with having the right overall product goals, market/customer insight and target specifications. From this starting point, you can begin to design the circuit boards and other components that need to work together. This typically takes place in your preferred PCB design software. There are many tools available, but you should use one that is strong at combining PCBA designs and using 3D visualization to accommodate PCB stacking, such as Altium Designer or Cadence's PCB layout tools. When working with the design software, simplify your view to see split planes and return paths between the boards. If the digital signal must cross a split in the power reference plane, use one or two plane decoupling capacitors (100nF) to close the offending signal. Another rule of thumb is to avoid routing traces in parallel and broadside as they cause greater amounts of PCB crosstalk than those routed perpendicular. Since traces are wider than they are thick, they pick up more radiation when on top of each other. Designing them to be perpendicular reduces overall coupling from one trace to another. The example above of a parallel trace design is a poor practice. However, broadside trace design is sometimes done on purpose and calculated into their PCB design. If you are not experienced with this type of design and it is not accounted for, we strongly recommend designing the traces perpendicular. The below image is of an intentional broadside design. A common approach to connecting multiple boards is the stacking of boards on top of each other with connectors separating the boards. When designing for boards to be stacked, the substrate needs to be planned carefully to reduce impedance discontinuities, signal coupling and excessive electromagnet emissions. All signal layers should be adjacent and closely coupled to an uninterrupted reference plane. Closely coupled planes reduce AC impedance at the top end and dramatically reduce electromagnetic radiation. Radiation is further reduced by routing high-speed signals between the planes. Throughout the design workflow, be sure to consider how to integrate testing into your overall product production plan. Boards that are connected will need additional and more sophisticated testing to ensure signal strength and other operational specifications are met. It's much easier to incorporate this as the design proceeds than to go back when you are finished. What are the parameters that need to be addressed in testing? Generally speaking, any high speed signals or traces sensitive to noise should be tested. Some examples are serial interfaces (SPI, I2C, UART, etc. ), analog signals such as pre-amplified sensor measurements, audio signals, and high power traces that could have voltage drop, depending on how much current is flowing and if there's enough copper on the traces and connector pins. Taking the manufacturing process into consideration during the design phase will be important for the future repeatable construction of the final product as well as how to possibly service the product in the event of a failure. Designing for manufacturing typically means incorporating test points into the overall design. Test points are commonly placed at the edge of the board to allow for probes to be easily connected to the circuit for assessing voltage. Depending on your design, you may want a simple bare board test or more complex functional test while the board is energized. The board house could have the capability of having flying probes and programming it with the location of your test point pads. Designing for future serviceability is an important factor to consider as you may need to troubleshoot or repair a product after it has been used and perhaps broken or otherwise become non-functional. 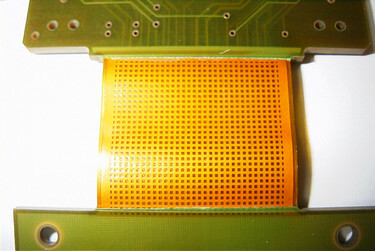 It will be important to design a mechanism for probing the entire assembly while the boards are connected, such as using a flex cable between multiple boards. With the cable harness replacing a straight pin-type, rigid connection, you can flip the boards over and have much easier access to probe while energized. High speed design interconnectivity, such as clock signals and triggers for communication interfaces, requires specific considerations to ensure system performance, particularly in low-power environments. Steps need to be taken to minimize cross talk and excess noise generation, among other factors. Impedance matching is also important as it maximizes power transfer and minimizes signal reflection at high speeds. At high speeds, a signal from a low-impedance source being transferred to a high-impedance source will flip its phase 180 degrees back and forth without proper termination of each end. Here's a tip: For high speed SPI communication you will want to consider adding in-line resistors or buffers before connecting to an external board. The resistance you use is directly related to your PCB trace impedance. Using too little will consume a lot of current. Using too much resistance will have little to no effect on improving your signal transfer. For high speed signals, it helps to have a ground in-between every other pin on the connector (for example, pin 1 = power, pin 3 = trigger 1, pin 5 = trigger 2, pin 7 = trigger 3 and pins 2, 4, 6, and 8 are all ground). This helps with reducing inductive coupling and cross talk. That's some of the tried and true tips and considerations when designing for effective interconnectivity of PCBs. At the outset, keep in mind the overall product goal and market. Starting with good design software, work through a workflow that takes key design, test, manufacturing and servicing into consideration before your first board is spun. This is just the start to get you thinking and planning for the essentials to interconnected boards. In our next article, we’ll delve deeper in how to select the right components and incorporate specific testing protocol into the production process. Common problems and how to troubleshoot them will also be covered as well. So start brainstorming that next product and consult with San Francisco Circuits to make your product concept a reality.